Lighting effects, LED-based displays and matrices, even volumetric displays then become powerful. And since it’s all networked, interfacing is quite flexible. The hardware looks cool, as well. Inside is a powerful processor (a 32-bit ARM Cortex-M3 based LPC1758, if you must know). Update: this isn’t fully open source hardware, but includes a lot of open source components. The library and “API” are open, but it appears the hardware itself is closed, at least initially. Still, having the API is a step, and I would happily invest in a closed solution if it works. 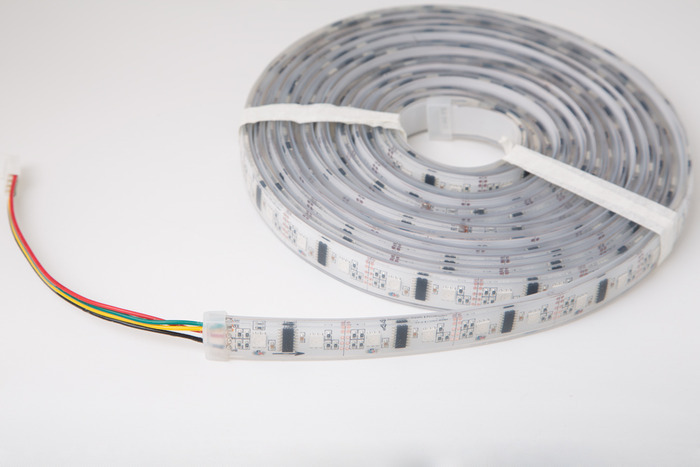 I expect the bigger obstacle for practicality is that these LED strips tend to be expensive once you start combining a lot of them, but on a smaller scale, this could be absolutely spectacular. The hardware is pretty straightforward, so if you want to write your own firmware for it, you can go ahead and do that- we include the PCB layout in the documentation, so that’s something you can do if you want to. On the other hand, we’ve spent six months writing it, and it’s pretty good, so I’m not sure why you’d want to do this. The project looks terrific, and I do expect to see more of these things. So, I’ll be interested to track their progress and see how they fare. Know of other similar solutions, or got any questions? Shout out in comments.